Back in the olden days when learner riders were 17 years-old, and half their miniscule body mass was pimple-juice it was fine for motorcycle manufacturers to build teeny-tiny, 125cc bikes that weighed nothing and with minimal de-restriction could be made to do one million mph. Sadly, most of us learning to ride in 2018 are a little older, a little more spacious and much less likely to fit onto a sports or naked 125 without looking like a bear on a tricycle. Which means that a roomy, tall 125cc machine makes a lot of sense. There aren’t a lot of full-sized new 125s available anymore, but thankfully, you can still find a decent 1990s trail bike for not too much money. All the Japanese manufacturers sold a two-stroke 125cc trail bike back then. Most also sold a slightly bigger version in their home markets, but only Kawasaki brought the 200cc version of the KMX into the UK. In restricted (12bhp) form the 125 did 71mph and 50mpg, but most were easy to derestrict (once you’d passed your test, of course) at which point they were making 20bhp and would do an easy 80mph. The KMX200 didn’t go that much faster but it did have a lot more bottom end power and stronger acceleration. What we forget now is that, to a 17-year-old, whose previous experience of vehicle control was either a bicycle that did 15mph or a restricted moped, being in charge of a two-stroke 125 that would do 71mph was like giving a goldfish a jet-ski. Your first ride, head in the clouds, on a state-of-the-art, water-cooled KMX125 was the most exhilarating and terrifying experience of your life so far. Even today, when most new riders have already driven a car, the feeling of travelling at 88 feet-per-second (60mph) in the open air, with only a thin piece of leather and ill-fitting polystyrene hat between you and the countryside is a life-changing event. Kawasaki’s KMX125 and Yamaha’s DT125R dominated the learner market. The Yamaha was slightly quicker and handled slightly better, but the Kawasaki had a reputation for being hard-as-nails and more likely to survive abuse. All the Japanese 125s had a similar spec. A single-cylinder, water-cooled, two-stroke engine, fitted with a ‘power-valve’ system in the exhaust port that was non-functioning in the restricted bike, but when derestricted would work as intended, allowing the bike to have strong low-revs power and a screaming top end too. The KMX125 arrived in 1986 at a time when Kawasaki were dominating the superbike and middleweight classes and had just launched a super-tourer (the GTR1000) against BMW. The KMX had sharper styling than the current Yamaha DT125LC, went a couple of mph quicker and was slightly taller, brasher and more in-your-face. To non-riders the size of it made the KMX look like a bigger bike, meaning that once your L-plates had accidentally fallen off (usually by week three), you had a lot more credibility arriving in the next town with your mates on a mission to broaden the Heckmondwike gene pool. In the end it wasn’t power or top speed that mattered so much as the KMX’s ability to beat any four-wheeler away from the lights and keep ahead until the next set. Acceleration from 0-40mph was what counted and a standard KMX125 was as good as any other 125. Derestriction was possible and easier (and harder for Officer Dibble to detect) on the Kawasaki than the Yamaha. A noisy exhaust was compulsory, as was all kinds of other two-stroke black magic such as S&B air filters, Ledar carb corrector kits, aftermarket reeds and a porting job done by your best mate’s older brother who had the fastest RD350 in Salford. None of this stuff made that much actual difference, other than to make your bike blow up sooner, but boys love geek, knowledge brings status and being able to take part in the appropriate speedy conversations was a rite of passage. No one cared about how well it handled or braked. Hormones and heroism were enough to get any learner bike around a corner. Similarly, no one really cared about making sure the steering head bearings were tight, or that suspension linkages moved freely, or chains were adjusted properly. The best teenage riders could reduce a brand new KMX125 to a dangerous heap of scrap in a couple of years without ever taking it off road. Most of them did end up off-road, but only after being stolen, stripped and used as field bikes by the local scrotes. Sadly, both of the above happened at some point in pretty-much every KMX125’s life meaning that the one you buy now will be absolutely, comprehensively and utterly wrecked. Which means that depending on the kind of buyer you are, a 1980s KMX125 is either the worst choice of bike you can make (if you’re a regular new rider) or an essential mission to re-discover your Clearasil-spattered fantasies as nostalgia takes over and the desire to burn a few thousand quid reliving the best summer of your life (in Heckmondwike?) is overwhelming. There are a couple of alternatives to this; these kind of bikes stayed on sale in Europe for longer and sold well too. There are plenty of tidy examples still around on the continent and a handful of canny UK independent importers are doing the hard work for you and tracking them down. The best known is Unit 5 Motos (Unit5motos.co.uk), based in Essex, who have a regularly changing stock of small capacity, often two-stroke machines. 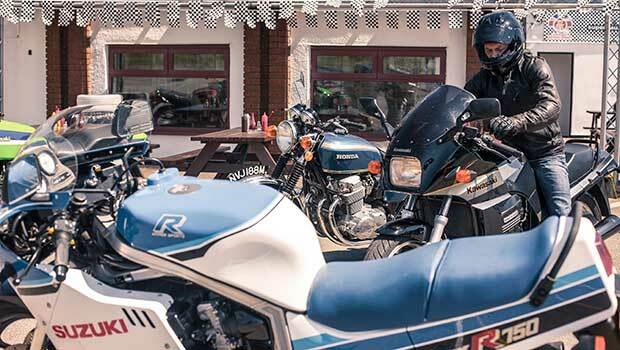 Some are mint, some are projects, but almost all are in much better condition than a typical UK bike and the prices are on the right side of ‘How Much?’ to be tempting. The other alternative is to spend a little more and wait for a decent KMX200 to come up. Many were off-roaded (some even by their actual owners rather than teenage thieves), but most were looked after too and tend to be in better nick. Essentially the 200 is the same bike as the 125 but with a working powervalve and more power everywhere. They are a real joy to ride; not too tall, not too heavy, plenty of acceleration and tough as old boots. It’ll take a while to track a good one down but is worth the wait.